The Godin EPM Quantum IT acoustic guitar system is simple in design and outstanding in performance. 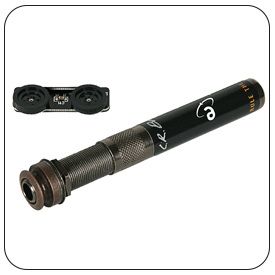 In combination with the transducer, the EQ control range and frequency content have been specifically contoured to provide a very rich and full sound reproduction resulting in performance seen only in far more complex systems. 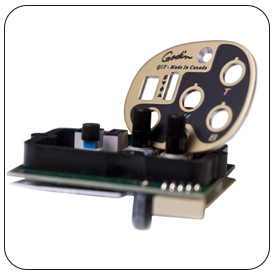 Features volume, treble and bass controls as well as a built-in tuner with auto shut-off. The Element Active System-VTC builds on the strengths of the EAS with the addition of a treble tone control and a special low frequency compression circuit. The LF compressor tames low end thump and mimics the actual dynamic response of the guitar for enhanced realism. 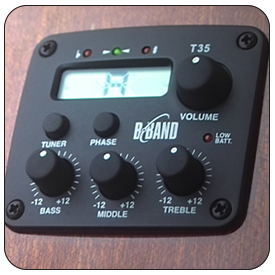 The Natural Element models include the B-Band T35 electronic system with onboard chromatic tuner. LED low battery and "blink" switch-on status. The Trek series models are available with optional Fishman Isys Onboard Preamp Systems with onboard chromatic tuner. These preamp systems feature Volume, Tone shaping, and Phase controls; a pre-wired Fishman Sonicore pickup and low profile control knobs. Also included are a low battery indicator and a separate battery box. 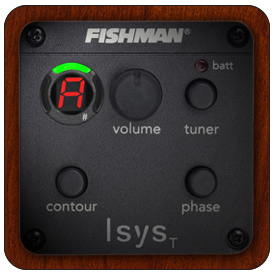 Fishman Isys+ Features : Volume control, EQ tone shaping control, Phase switch, Low battery indicator, Low profile control knobs, Onboard easy to read 7-segment LED tuner, Bass and Treble controls for enhanced tone shaping.